This walk: 2011-6-30. 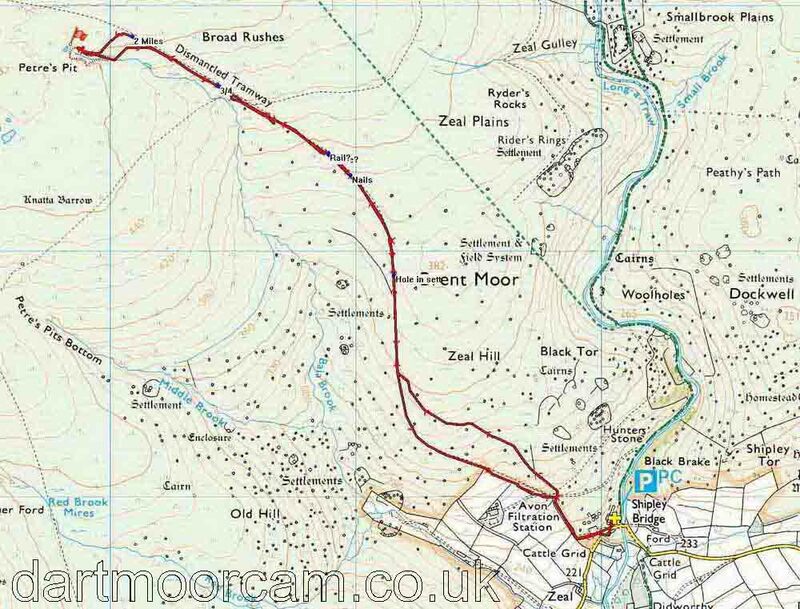 Zeal Tor Tramway, granite setts, iron nails, possible wooden rail, 3/4 milestone, 2 miles marker, Petre's Pit, Shipley Tor. Section of a concrete trough - something to do with channelling the china clay slurry down to the drying works at Shipley Bridge? The works were formerly the naphtha works of the South Brent Peat and Peat Charcoal Works, established in 1846. A run of granite setts to which the old wooden rails were fixed by nails; the tramway was built in 1847. Granite sett with an iron nail still affixed. Another nail in a sett. A run of setts with a few nails, at SX 66980 64309. Nearby was a manmade, raised circular area, possible a crane base plus a possible siding, at SX 66891 64391. An exposed section of what might be one of the original wooden rails, at SX SX 66888 64398. A section of exposed track bed. The building in the previous photograph is believed to be one of two seen towards the right edge of this aerial photograph. The tree can be discerned at lower left, above and slightly left of the "44 m" label, this being the length of the scale bar at lower extreme left. Note the two parallel lines, perhaps remnants of old tramway track, possibly from when the pit was reopened in 1923 by the owners of the Redlake and Leftlake china clay pits? The famous 3/4 milestone. This is about 1¾ miles from Shipley Bridge. This stone is composed of two different rocks, granite at the bottom and another, black rock above. Showing the scale of the stone. Looking across the lower end workings of Petre's Pit area - these look like tin workings. General view looking north-west from the northern edge of the Petre's Pit workings. Looking back up towards the main pit. Looking down towards Shipley Bridge. Built-up section at the bottom of the tramway, very near Shipley Bridge. This walk was reached via the Marley Head exit from the A38 near South Brent and following the road north to Harbourneford Cross, turning left at Gingaford cross and following the road over the small bridge at Shipley Bridge, parking in the large car park on the right, marked by the yellow cross and the P symbol on the map.